The policing of this year's Run to the Sun rally in Newquay has been praised by traders and hoteliers. The event, previously dogged by late night illegal revelling, has passed with little incident. Between 80-100,000 people usually converge on the resort for the custom car and VW festival. The Chair of Hospitality at the Newquay Association of Tourism and Commerce, Ray Newton said the event was extremely successful. He says if there were problems they were minor. "I think the businesses, the clubs and the shops do very well out of it," said Mr Newton. "It certainly affects some of the hotels along the front. "Various hoteliers said that the biggest problem seems to be at night with the constant flow of traffic noise keeping their guests awake." 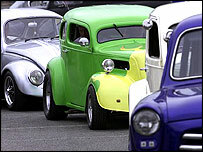 The festival is entering its 15th year and has grown into one of the largest custom car and VW festivals.